​Robert Sobukwe (1924-1978). Leader of the Pan Africanist Congress (PAC) in South Africa, a focal leader in the struggle against apartheid, Sobukwe was so feared by the apartheid government that after he led a mass non-violence protests to break unjust laws, he was jailed indefinitely for fear of what he might do. A law was created, called the 'Sobukwe clause' (as it was created for him, and only used against him), that would allow for his imprisonment not for what he has done (that time had been served), but what he was capable to do. 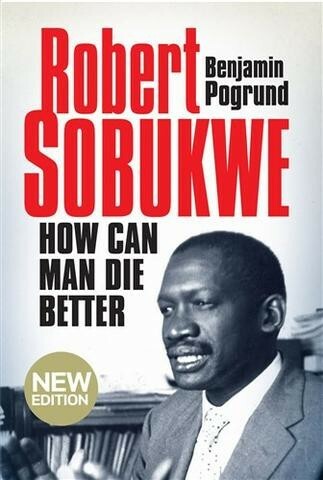 "How Can Man Die Better" (original 1990) by Benjamin Pogrund is one of the few books available on Robert Sobukwe, but one wishes more was available. As much as readers may come to appreciate the author, this book is probably better described as two biographies (one of Robert Sobukwe and one of Benjamin Pogrund, the author), and in that regard the book is somewhat disappointing. Nonetheless, given the lack of detailed resources on Robert Sobukwe, this book is well worth reading. Robert Sobukwe was a force in his opposition to unjust laws. He stated that we "have been accused of bloodthirstiness because we preach 'non-collaboration'. I wish to state here tonight that that is the only course open to us. History has taught us that a group in power has never voluntarily relinquished its position. It has always been forced to do so" (p. 37). Yet, in his forcing of change, he was a staunch advocate of non-violence means. The original arrest of Sobukwe was in relation to a mass movement he led to break the unjust 'pass laws' requiring people of color to carry passes everywhere they went, and face arrest if in the wrong place, or at the wrong time. "Sobukwe began to plan the campaign: workers were to be urged to leave their passes at home and report to the nearest police station on their way to work. They would, he anticipated, be arrested and prosecuted for not carrying a pass; this would have the twin effect of putting pressure on the government through clogging police stations, courts and jails, and on employers to intervene because they would be without labour" (p. 111). Alternatively, and contrary to the popular narrative outside South Africa, "Mandela acknowledged that he had planned sabotage [i.e. adopted violent means]. He had decided it was unrealistic for black leaders to keep up the African National Congress' traditional policy of non-violence when the government frequently used violence to crush opposition, he told the court. 'Africans had either to accept inferiority or fight against it by violence. We chose the latter'" Mandela stated (p. 212). Robert Sobukwe was released after years of imprisonment, and after six extensions of the 'Sobukwe clause' to imprison him for what he might do, rather than anything he had done. His physical health was in poor condition (he would later die of lung cancer), and his mental health challenged, after years of severe solitary confinement. Once released, he was severely monitored and restricted, effectively under permanent house arrest until his death.